In our previous article, we theorized that, as Man's forays into space, starting with the American Gun-Club's Moon Launch of 1865, became both more frequent and more imperialistic, the alien lifeforms who had colonized our Solar System withdrew further into space, taking with them the interplanetary "eco-sytem" which we dubbed "Aether Space." Naturally, this transition did not happen overnight, and was in fact spread over a 60 to 70-year period, ranging from the 1870s to the late 1930s. This article will examine what happened during this period of space exploration, including several invasions, and ultimately delve into the reasons why human expansion into space came to a crashing halt in the 1940s, and became a virtually forgotten period of human history. As the Western Powers embarked on the glorious conquest of space, as they had conquered Africa, most of Asia and indeed the rest of Earth, the theoretical foundations for space science (which was dubbed "astronautique" by J.H. Rosny Aîné only in 1925) were laid down. The preeminent French astronomer Camille Flammarion popularized astronomy and cosmology, and discussed the physiological properties of extra-terrestrial life in his ground-breaking La Pluralité des Mondes Habités (The Plurality of Inhabited Worlds) (1862), Les Habitants de l'Autre Monde (The Inhabitants of Other Worlds) (1862), Les Mondes Imaginaires et les Mondes Réels (Imaginary and Real Worlds) (1864), and finally, Les Terres du Ciel (Lands in the Sky) (1884). François-Henri Peudefer de Parville's Un Habitant de la Planète Mars (An Inhabitant of Planet Mars) (1865) recorded the discovery in America of the calcified body of an Ancient Martian, whisked away from his native world by a comet. In 1877, Iytalian astronomer Giovanni Schiaparelli called the peculiar markings he observed on Mars canali, leading to widespread speculation over whether these "canals" were constructed by intelligent beings. Finally, also in 1865, Baron Alfred d'Espiard de Colonge's La Chute du Ciel ou Les Antiques Météores Planétaires (The Fall From The Sky or The Ancient Planetary Meteors) tellingly hypothesized that life on Earth had, in fact, originated on another world, and may have started on our planet as the result of deliberate seeding by another race. Such research into the possibly extraterrestrial origins of Man were later echoed in American attorney C.C. Dail's Willmoth the Wanderer (1890), in which an ancestor the same Saturnians previously encountered by Voltaire in 1752 were claimed to have bred prehistoric men, as well as by later works by the late Professor Bernard Quatermass. As we saw in our previous article, the conquest of space had become a battlefield between two radically different scientific approaches. Early on, the method that prevailed was rocket power and electricity, thanks to the Gun-Club and other powerful industrial and manufacturing lobbies. In the wake of the Gun-Club Launch of 1865, another group of American businessmen launched the first American inhabited artificial satellite, dubbed the "Brick Moon," an experiment recorded by author Edward Everett Hale in his eponymous account, The Brick Moon. A band of valiant Frenchmen, led by Hector Servadac, were able to use a passing comet to hitch a ride and conduct a rudimentary first survey of the Solar System in an asteroid christened Gallia. 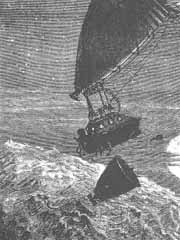 Jules Verne wrote a somewhat dramatized report of this journey in Hector Servadac, also known as Off on Comet. André Laurie, an occasional collaborator of Verne, reported in his account Les Exilés de la Terre (Exiled From Earth) that another international business consortium, the Selene Company, had launched a huge spaceship from Sudan, intending to exploit the Moon's mineral resources. The technology involved the use of solar reflectors to provide the energy required to convert a iron-rich African mountaintop into a huge electromagnet. Eventually, the would-be entrepreneurs returned to Earth empty-handed by re-energizing the mountain. That same year, engineer Henri de Graffigny wrote his own account of a pioneering space journey in De La Terre aux Etoiles (From the Earth to the Stars), in which a small group of Earthmen travelled to the Moon, then to Venus, and then aboard a comet throughout the Solar System. It is worth noting that, in 1904, de Graffigny actually flew a rocket-powered model airplane and, in 1915, he worked on a proposal to catapult a capsule into orbit. Rev. Wladislaw S. Lach-Szyrma's Letters from the Planets described how he was taken aboard an advanced, spindle-shaped spaceship for a tour of the Solar System by the Venusian Aleriel (whom he had initially met in 1874) and a crew of Mercurians. By far the most important space journey of the late 19th century was chronicled by Georges Le Faure and Henri de Graffigny in Les Aventures Extraordinaires d'un Savant Russe (The Amazing Adventures of a Russian Scientist), which was prefaced by Camille Flammarion. This Franco-Russian expedition used a nickel-magnesium alloy spaceship, the Ossipoff, launched from a cannon built inside the Cotopaxi volcano. Oxygen was stored in tablet form and carbon dioxide was removed with potassium hydroxide. Electricity provided light and heat. Once on the Moon, the explorers used a jet-propelled craft to take them to Venus. They then travelled to Mercury by solar power, using the pressure of solar winds on a hollow sphere. They continued their journey to Mars, using a fragment of Mercury torn away by a comet. They discovered that Phobos was atmospherically connected to Mars (not unlike the Moon was to the Earth, once), and travelled by balloon down to the red planet, wearing pressure suits. After having established contact with the Martians (more about this below), the explorers flew to Jupiter in a barrel-shaped, reaction-powered starship, which sucked interplanetary debris at one end and expelled it at the other. Interplanetary communication was achieved through beams of light picked up and modulated by selenium photocells. The year Alexander Graham Bell began to experiment with rocket power, George Le Faure also reported on other instances of space travel in Quinze Mille Lieues dans l'Espace (Fifteen Thousand Leagues In Space), and Les Robinsons Lunaires (Moon Robinsons), in which a propellor-driven ship crashed on the Moon, possibly the first major Titanic-like disaster in the history of early space travel. As the century neared its end, Pierre de Sélène reported in Un Monde Inconnu (An Unknown World) that the original Gun-Club cannon had been sold to an Englishman for slightly over $200,000, and that another space launch had dispatched another crew of explorers to the Moon. This time, they successfully landed on our satellite and met an advanced race of Selenites. But first, let us note that these Rocketeers' exploits were not the only instances of early space travel. Ever since George Tucker's discovery of the gravity-repelling properties of Lunarium in 1827, another camp had sought to tackle space travel through the means of gravity control. Afrter the French anti-gravity experiment reported by Alexandre Dumas in 1860, another experiment took place in England in 1864 -- one year before the Gun-Club Moon Launch! It was chronicled by an anonymous writer using the nom-de-plume "Chrysostom Trueman" (hiding his real identity as the alchemists had once done, for security reasons, obviously) under the title of The History of a Voyage to the Moon. While the partisans of rocket power were still engaged in mere Lunar expeditions, another, far more ambitious, space journey was chronicled by Percy Greg in Across the Zodiac. Greg claimed that the event had taken place 50 years before, but that was a lie, also clearly made up for security reasons. In his account, Greg revealed that the Astronaut, a privately-built ship of 150 feet long, 50 feet wide and 20 feet high, was the first human spacecraft to travel to Mars! The Astronaut was propelled by Apergy, not a gravity-repulsive material like Lunarium, but a force that had to be generated and controlled. The hero who built the Astronaut was purposely left unidentified by Greg, but was in fact very reminiscent of the man we know as Nemo or Robur (among other identities) (see accompanying article, Who Was Nobody?). We should also remember that, a mere eight years earlier, Nemo had become involved in Phileas Fogg's celebrated 1872 journey around the world, which itself was alleged to be a cover for some alien shenanigans, as reported by Philip Jose Farmer. His involvement in the development of space technology should therefore surprise no one. It is therefore a distinct possibility that the man calling himself Nemo was the first man to set foot on Mars -- with the exception of the American John Carter -- a full ten years before the Franco-Russian expedition reported by Le Faure & Graffigny? Apergy was used again in an enterprise sponsored by multimillionaire John Jacob Astor, who chronicled it under the title A Journey to the Other Worlds, but like Greg, craftily chose to set it in another time period (in this case, the year 2000), again for security reasons. This time, the mysterious cabal who financed and built the Callisto (a squat cylinder made of beryllium, 15 feet high and 25 feet in diameter), aimed to travel to Jupiter, Saturn, and even to an hitherto unknown trans-Neptunian planet called Cassandra. Only Astor's vast resources could have financed such an enterprise, and its true results were kept carefully hidden. Undoubtedly, Gustavus Pope's "ethervolt ship", which successfully conveyed a US Officer first to Mars, then to Venus, in 1894 and 1895, and dramatized in Romances of the Planets, worked using the same technology, and may also have been financed by Astor. In another account, tellingly also entitled Across the Zodiac, British author Edwin Pallander described the journey of three protagonists taken across the Solar System in a smaller antigravity-powered spaceship captained by a "mad scientist" -- clearly Nemo again. Thus, at the end of the 19th century, we note a clear division between two kinds of space travel: On the one hand, powerful, imperialistic efforts were made using rockets, bankrolled by industrial concerns, with much publicity, but ultimately inferior results. On the other hand, far more advanced journeys were undertaken using anti-gravity technology, farther and further, but conducted in almost total secrecy. Tellingly, these journeys appeared to involve a small cabal of men, like Nemo, Thomas Alva Edison (see below) and multimillionaire John Jacob Astor in the United States, and Mors in Germany, who had numerous contacts with alien intelligences during that period. We do not know for certain what went on during these missions. Undoubtedly, information was exchanged, and secret treaties were made. Ultimately, the use of anti-gravity in space travel would prevail during the next, expansionary phase of space conquest, but it was going to take a massive invasion of Earth to tip the scales. But before we move on to that next chapter of our history, we must first take a side look into fiction. Much as the real-life exploits of gunslingers like Billy the Kid or Jesse James spawned a large number of totally fictitious but highly popular accounts, which became known as "westerns", so did the real-life exploits of space travel, which eventually gave birth to the form of literature known as "science fiction.". 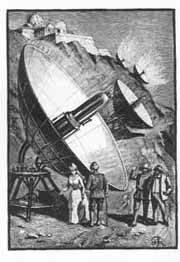 Charles Guyon's Voyage dans la Planète Vénus (Voyage To The Planet Venus) (1889), in which the heroes travelled to Venus in a hot air balloon, and the Venusians used a cannon to send them back to Earth. Marcel Laurian's L'Étrange Voyage de Monsieur Narcisse Barbibon (The Strange Journey of Mr. Narcisse Barbibon) (1912), in which the Red Planet is described as inhabited by prehistoric monsters, electro-magnetic beings, black-skinned and red-skinned anthropoids, winged sphinxes, mermaids, cyclops and even the famous seer Nostradamus (!). Fiction is always a distorted mirror of reality. What is clear from this incomplete list is the extent to which space travel and the conquest of space mobilized spirits in the last decades of the 19th century. The 20th century started with a bang. Unlike the more peaceful aliens who dwelt on Mercury and Venus, Mars was home to numerous species, many warlike. Indeed, the accounts of Gustavus W. Pope's Journey to Mars (1894) and Journey to Venus (1895), in which a US officer visited an advanced Mars (and fell in love with a princess), then a prehistoric Venus; that of Lt. Gullivar Jones, as reported by Edwin Arnold in 1905, and finally that of the notorious John Carter (published only in 1912 by Edgar Rice Burroughs), left no doubt as to what mosaic of warring species the Red Planet was. But Mars was not home to only swordsmen, barbarians and princesses. It also housed vast intelligences, from the mysterious Eldils to the Great Brains, and others, who could not see the increasing encroachments of Earthmen and remain passive. Whatever secret treaties may have been initially negotiated by men like Nemo and Astor were undoubtedly bound to be broken, as had the treaties made with Native Americans in America a little earlier. German philosopher Kurd Lasswitz was the first to reveal the presence of a superior Martian military force on Earth in his top secret report Auf Zwei Planeten released that year. Not only was a Martian space station detected in geostationary orbit above the North Pole, but in fact Martians had already started to built a beachhead at the Pole. Being a philosopher, Lasswitz speculated on what might have happened were the Martians to succeed, but in reality there is little doubt that their attempt at covert conquest was immediately crushed by the Western Powers' military might. Indeed, the frantic efforts by Amundsen and Peary to reach the Pole in 1909 were likely to be but a mop-up expedition to clean out the remains of the Martian outpost. The destruction of the Martian space station resulted in swift retaliation. The story of the first full-scale Martian attack launched in 1897 and dramatized by H.-G. Wells in his world-famous report War of the Worlds is too well known to have to be retold here. What is not as well known is that the United States immediately launched a counter-attack, led by inventor Thomas Alva Edison, a member of the Billionaires' Conspiracy. This operation was reported under the misleading title Edison's Conquest of Mars by Garrett P. Serviss. It was at that point that antigravity, like VHS over Betamax, definitively won the battle of standards, and would remain the technology of choice until the 1940s. Edison launched an international fleet of one hundred antigravity powered ships, carrying an atomic disintegrator beam of his invention. By causing a melting of the Martian icecap, Earth dealt a deadly blow to the hostile forces of Mars. Another expedition, led by Nikola Tesla, and including Edison's nephew, followed almost immediately, and also extracted its pound of flesh from the Martians. This action was reported by Weldon J. Cobb in At War with Mars and To Mars with Tesla (1901). Again, antigravity technology, clearly superior to rocket technology, was used. Another, peaceful, individual journey to Mars, involving a cigar-shaped antigravity spaceship landing in an isolated part of the planet resembling Ancient Egypt, was also reported that year by Ellsworth Douglas in The Pharaoh's Broker. The crew of the British spacecraft, the Astronef, an antigravity-powered ship designed by the late Prof. Hartley Rennick, and manned by Rollo Lenox, Lord Redgrave, his bride Zaidie and their trusty old engineer Murgatroyd, were attacked by the Martians near Phobos. After soundly trouncing them, the Astronef carried on its explorations of the Solar System. In England, Professor Cavor developed a refined form of Lunarium, which he christened Cavorite, and used it to launch a new expedition to the Moon, as reported by H.G. Wells under the grossly misleading, but far more commercial and natonalistic title of First Men in the Moon. As noted under "1896" in Chapter 2 above, as a result of the successive waves of human exploration, the Moon was, by then, mostly abandoned by the aliens who had lived on it. Only a few species survived in its caverns. A smart businessman, Cavor took films of his journey, which were later licensed to, recut with added studio footage, and exploited by, French filmmaker George Melies under the title A Trip to the Moon (1902). After a slow start, the French were not to be left behind. French scientist Docteur Omega, whose career was chronicled by Arnould Galopin in the eponymous Docteur Omega, built a spacecraft dubbed Cosmos, powered by an antigravitational substance he alternatively called repulsite or stellite, but which undoubtedly was merely a derivative of Lunarium or Cavorite. Omega and three French companions travelled to Mars and, in the typical chauvinistic attitude of the times, reported encountering some "extremely ugly aliens." Robert Darvel, a young American engineer, and likely a friend of Nemo, built a "psychic-powered" spaceship with Hindu help -- let us remember that one of Nemo's aliases was that of Hindu Prince Dakkar. On Mars, Darvel ran afoul of a race of hostile, bat-winged, blood-sucking natives, a once-powerful civilization now ruled by the Great Brain. The Great Brain got rid of Darvel by sending him back to Earth with some of his "Vampires". Another, more localized war of the worlds ensued, with Europe being under siege from the Vampires. However, some of them rebelled and helped Darvel return to Mars to destroy the Great Brain. The story of the "War of the Vampires", as it became known, was chronicled in Gustave Le Rouge's Le Prisonnier de la Planète Mars (The Prisoner of Planet Mars) (1908) and La Guerre des Vampires (The War of the Vampires) (1909). Also in 1908, adventurer Serge Myrandhal reached Mars, also using another "psychic-powered" spaceship, the Velox -- probably a copy of Davel's ship. There, he was met by the Houas, small, red-furred anthropoids who lived underground, and the Zoas, beautiful winged humanoids, also referred to as "Elohim." Myrandhal's adventures were chronicled by Henri Gayar in Les Aventures Merveilleuses de Serge Myrandhal sur la Planète Mars (The Wondrous Adventures of Serge Myrandhal on Planet Mars). During this period of imperialistic expansion, we can already detect telling signs of increased nationalistic tensions, and so-called patriotic sabre-rattling, that heralded World War I. As early as 1900, in The Struggle for Empire, Robert William Cole pushed the theory that it was the Anglo-Saxon race's duty to conquer the Stars -- only to face aliens from Sirius. This portion of his account is very likely a work of fiction, but the ideology contained therein was indeed characteristic of the times. We have seen in the previous chapter that, having defeated the Martians, their only serious opposition, the nations of Earth were moving into space in force, exporting their imperialistic ideologies. In 1908, a Russian bolshevik travelled to Mars in an effort to convert its natives to Communist utopia, but in vain. This newsworthy account was reported by Alexander Bogdanov in Red Star. In 1911, the mad scientist Oxus actually tried to conquer Mars, but was barely defeated by the first scientific superhero -- Jean de Sainclair, a.k.a. the Nyctalope. This attempt was chronicled by the Nyctalope's biographer, Jean de La Hire in in Le Mystère des XV (The Mystery Of The XV). Even worse was engineer André Mas' 1914 report, the self-explanatory Les Allemands sur Vénus (The Germans on Venus) (1914), a propagandistic tract which reported Germany's alleged exactions committed on Venus. The year before, Mas had proposed to divide the Solar System between the various Earth powers: Russia would get the Moon, the United States, Saturn, Japan, Jupiter, France, Mars, etc. It is almost a certainty that, had not World War I burst upon the great nations of Earth, the planet was poised to take another, giant conquering leap into outer space... and beyond. 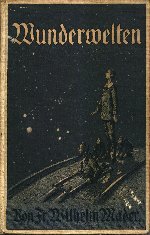 In fact, the striking 1911 account Wunderwelten (Distant Worlds) by German author Friedrich Mader featured the "worldship" Sannah, an antigravity sphere of 146 feet in diameter, which travelled first to Mars, then made the very first journey to another star by travelling to Alpha Centauri and back at several times the speed of light! One can only speculate at the breakthrough made by German scientists, except to remember that Nemo's German "pupil", Captain Mors, had already built ships capable of exploring the entire Solar System during the years 1908-1911. And many have speculated that Nemo himself was on board the Sannah during her first journey. In 1908, the year of Darvel's and Myrandhal's journeys to Mars, in La Roue Fulgurante (The Fiery Wheel), Jean de La Hire reported the abduction of five Earthmen by the eponymous "fiery wheel" (a flying saucer? ); the hapless humans were taken to Mercury by aliens who looked like columns of light. In 1912, French writer Maurice Renard, under the title Le Péril Bleu (The Blue Peril), chronicled a series of "close encounters" with invisible creatures from the upper strata of Earth's atmosphere, later dubbed "Sarvants", who had begun to capture humans for investigation. Needless to say, they were exposed and either destroyed or driven away. In 1911, Abbott Théophile Moreux's Le Miroir Sombre (The Dark Mirror) described how a small group of human scientists began to communicate with Mars through the eponymous, radio-telescope-like device. In 1915, in The Moon Maiden, Garrett P. Serviss exposed the fact that superior Lunar beings were attempting to influence Earthmen. In 1919, in Les Trois Yeux (The Three Eyes), Maurice Leblanc, Arsene Lupin's renowned biographer, revealed that a French scientist had exchanged images with superior, three-eyed, almost incomprehensibly alien intelligences, supposedly residing on Venus. World War I , with its 2.3 million dead and crippled, definitely buried the 19th century. Deep wounds were created in their collective psyche: On the one hand, the Allies had won the war, and chauvinistic pride and xenophobic arrogance were at an all-time high. On the other hand, the war had sapped the confidence of the European Powers, depleted their resources, and things could never be the same again. A social conflict began to rage in Europe between the forces of conservatism, and the forces of progress. The contributions of science and technology to the slaughter of World War I were only too obvious: aviation, tanks, rockets, these wonderful discoveries, had not just carried people to the Moon, but instead had contributed to the killing of millions. After World War I, space travel would resume, but for all the reasons stated above, the torch would pass from a weakened Europe to a strong and vibrant America. Dr. E. E. Smith began writing a report on the efforts of young American inventor Richard Seaton to develop a spaceship, the Skylark, powered by a new element, dubbed "X", which acted as a catalyst for the atomic decomposition of copper and uranium. Some have speculated that Seaton's competitor, Marc "Blackie" DuQuesne was, in fact, an alias of Arthur Gordon Pym, a.k.a. Nemo. In any event, Smith eventually magaged to get a romanticized version of his report published in 1928. As news articles about the real Jesse James and the real Billy the Kid had encouraged the creation of an entire mythology around the Old West, the astounding success of Smith's report on Seaton encouraged him to write a series of purely fictitious "sequels". In 1916, noted Russian scientist Konstantin Tsiolkovsky wrote Vne Zemli (Outside the Earth), a report heralding the launch of a spaceship crewed by an international committee of scientists, with the advocated purpose of surveying the solar system for future colonization. Tsiolkovsky disguised his report by pretending that the events chronicled therein took place in the year 2017, and by naming his characters after famous scientists, e.g. : Newton, Laplace, Franklin, but that was obviously a careful deception. They never learn, do they?... The Martians attacked Earth again -- Martians similar to the Vampires who had previously invaded our planet in 1908 -- but this time, the Jovians intervened on behalf of Earth, and subdued the Martians by using focused solar energy. Still, Earth was left to fight an invading force of body-snatching Martians, which it did with the secret help of allies from Venus. The tale of this third interplanetary conflagration was told separately by the writing team of Théo Varlet & Octave Jonquel in Les Titans du Ciel (The Titans of the Sky) (1921) and L'Agonie de la Terre (The Agony of Earth) (1922), and by Henri Allorge in Ciel contre Terre (Heaven vs. Earth) (1924). During this war, it was revealed that some Martians believed that Earth was the place where their souls reincarnated. These events indicated, not surprisingly, that not all aliens were prepared to abandon the Solar System peacefully. And it also showed that other aliens were prepared to intervene on behalf of Mankind to prevent the total destruction of the Human Race. 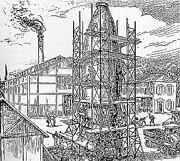 -- The development of a rocket using the controlled disintegration of "virium" -- a material 60,000 more powerful than radium -- was reported by Miral-Viger in L'Anneau de Feu (The Ring of Fire) (1922). That rocket travelled to Mars and Saturn at speeds exceeding 500 miles per second. -- A Russian experimental spaceship powered by the central nervous system of its pilot was described by V. Goncharov in The Psychological Machine and Interplanetary Traveller (1924). While its actual journeys to the Moon and Venus were described in detail by Goncharov, one cannot be entirely certain of the veracity of that account. -- A prototype spaceship made of coagulated aether, a substance both hard and transparent was reported by Albert Bailly in L'Éther-Alpha (1929). -- In 1921, a Russian space mission travelled to Mars aboard the Aelita, and returned in 1925 (landing in Lake Michigan), after fostering a revolt on the Red Planet, as reported by Alexei Tolstoy. -- In 1923, the Nyctalope flew to Rhea, an unknown satellite of Earth, using a spacecraft developed by Prof. Cavor, and settled a war between its winged day-siders and night-siders. This was chronicled by his biographer, Jean de La Hire in in Le Roi de la Nuit (The King of the Night). -- In 1925, Belgian author J.H. Rosny Ainé coined the word "astronautique" to describe another journey to Mars, in an attempt to restore peaceful relations between the two worlds. In his chronicle, entitled Les Navigateurs de l'Infini (The Navigators of Infinity) and Les Astronautes (The Astronauts), a human crew travelled to the Red Planet in the Stellarium, a spaceship powered by artificial gravity and made of "argine," an indestructible, transparent material. -- In 1926, Jean Petithuguenin reported the establishment of Une Mission Internationale sur la Lune (An International Mission on the Moon). -- In 1928, Fritz Lang made Frau im Mond, a film using actual footage from several previous German space expeditions. 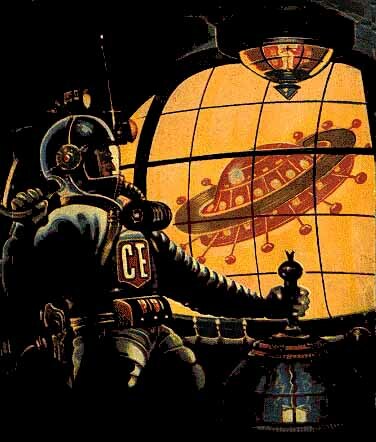 -- Finally, in 1929, the crew of the Éther-Alpha (see above) encountered energy-based aliens on the Moon. After testing the humans, the aliens decided they did not want to live next to them and moved away from Earth, a telling confirmation of what was happening in the Solar System at that time. By the end of the 1920s, it was clear that World War I had only slowed down the European Powers' conquest of space, but that Ametica and Russia were moving out aggressively. The aliens who had decided to strike back at Earth to slow its outward expansion had been either defeated by men, or prevented from destroying Humanity by higher, more ethical, lifeforms. It was at that point in time that the Cosmic Powers effectively began to move Aether Space outside the boundaries of the Solar System. Indeed, we find evidence of Aether Space being pulled out of the Solar System in two of the space reports filed in the early 1930s: René Pujol's La Planète Invisible (The Invisible Planet) (1931) told us of a mysterious new rogue planet being discovered in the solar system, and his Au Temps des Brumes (The Time of the Mist) (1932) studied the consequences of Earth being briefly enveloped by a mysterious "cosmic black cloud" that stopped all sunlight. Clearly, the Eldils and the other Cosmic Powers had enlisted the help of the space-faring aliens later studied by British astronomer Fred Hoyle in his dramatized novel The Black Cloud (1957) to help effect their prodigious feat of cosmic engineering, and hide it from the prying eyes of humanity. Again, this process did not happen without some conflagrations. Pierre Lavaur's La Conquête de la Terre (The Conquest of Earth) (1931) reported a short-lived attack on Earth by telekinetic Jovians, defeated through atomic power. Entire worlds, like Cassandra, Rhea, and Paloda (whose existence had been reported by Edgar Rice Burroughs in Beyond the Furthest Star) were moved beyond the Oort Cloud. 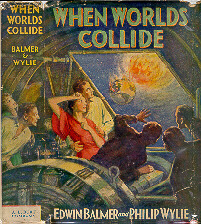 Not surprisingly, in 1933, reports of rogue planets in the sky caused Philip Wylie & Edwin Balmer to publish an embellished account of the fears of the times under the title When Worlds Collide. Another fact confirming the aliens' disengagement was the discontinuation of Robert Grandon's reports from Venus, as received by Dr. Morgan and embellished by Otis Aldelbert Kline in 1932. But like western authors who kept on writing about notorious outlaws, even after they had been reported killed, Kline went on to pen a series of wholly fictitious reports in the late 1930s. The same could be said, to a large extent, of the various extra-planetary reports filed by Edgar Rice Burroughs, and the reports by Ray Cummings of the Earthwoman Tama, taken to Mercury, although in each instance, it is hard to tell today where made-up accounts began to be used as a substitute for real-life ones. In 1932, Laurence Manning reported on the short-lived voyages of the spaceship Asteroid, providing clues on the ongoing changes in the structure of Outer Space, due to the pulling out of Aether Space. We are undecided on how to account for René-Marcel de Nizerolles' 108-issue serial, Les Aventuriers du Ciel: Voyages Extraordinaires d'un Petit Parisien dans la Stratosphère, la Lune et les Planètes (The Adventurers Of The Sky: ExtraordinaryVoyages Of A Little Parisian In The Stratosphere, The Moon And The Planets) (1935-37), featuring the adventures of an indomitable Parisian teenager named Tintin -- obviously after Hergé's popular comic-book character created in 1930 -- who used the hydrogen-powered spaceship Bolide to explore the solar system. The displacement of Aether Space from the Solar System to beyond the Oort Cloud had the intended result of restoring the normal physical properties of Outer Space, therefore effectively disabling most space travel based on Lunarium and any of its derivatives. The only antigravity compounds that retained their effectiveness worked only within the confines of Earth's gravitational sphere, such as the ones used by Dr. Fu-Manchu in 1940, the villainous Mezarek (who fought the Nyctalope) and others. One of the last major interplanetary journeys of the times was a modest affair, undertaken by Professor Bénac, the inventor of a spaceship called Meteor, based on old-fashioned rocket technology. Its crew was comprised of a young French engineer, an American journalist, and a young British woman. Their shortlived efforts were eventually reported, in 1951, by Richard-Bessiere in Les Conquérants de l'Universe (The Conquerors Of The Universe). But for all intents and purposes, the Quarantine of Earth had begun. In 1922, the egg of a small, chameleon-like, vampiric alien arrived on Earth on a meteorite. After hatching, the creature became stranded on Earth. (Reported by Cyril-Berger in L'Adversaire Inconnu (The Unknown Adversary)). In 1923, a Moon exploration venture failed and a space prospector discovered he could not return to Earth. (Reported by José Moselli in Le Voyage Éternel (The Eternal Voyage)). In 1930, in Les Diamants de la Lune (The Diamonds of the Moon), Henri de Graffigny reported on yet another attempt to explit the Moon's mineral resources. In 1924, an advanced, peaceful being from Mercury was found in crashed spaceship at the South pole. Unfortunately, the sled dogs killed the alien before he could share his knowledge with the Earthmen who rescued him. (Reported by José Moselli in Le Messager de la Planète (The Messenger of the Planet)). In 1930, Aurore Lescure, perhaps the first woman astronaut, brought back a space virus that "devoured" electricity. (Reported by Théo Varlet in La Grande Panne (The Great Breakdown)). The passing of the Old West had no effect whatsoever on the writing of westerns, and in a similar fashion, the rapidly approaching end of the space age had no effect -- quite the contrary, in fact -- on the growth of the budding science fiction genre. In fact, if anything, the real-life exploits of the early space pioneers only inflamed passions, and a growing desire for ever grander space sagas, ever more powerful heroes. One can only speculate as to what the real-life Nemo, Michel Ardan, Cavor or Richard Seaton would have made of the galaxy-hopping, sun-blasting exploits concocted by the likes of Edmond Hamilton or Jean de La Hire with his thirty-volume serial, Les Grandes Aventures d'un Boy Scout (The Great Adventures of a Scout) (1926), which included many interplanetary adventures with lurid titles. By the end of the 1930s, Outer Space was changing. With the pulling out of Aether Space, it was becoming a hostile, airless environment, where the nature of gravity was no longer susceptible to human control through substances like Lunarium and its derivatives, or forces like Apergy. Mankind had driven its alien neighbors to leave, and as they left -- willingly or unwillingly -- they took their "space" with them, and the very planets themselves were restored to their original condition: hostile environments, unfit for human life. In short, from the viewpoint of humanity, space was now harder to conquer than it had ever been before. Far from being the New Frontier that had been eagerly embraced fifty years before, space was now perceived as a costly, and ultimately failed, experiment. The promises of huge mineral wealth had not materialized. There had been no return on investment. Space was still the province of eccentric explorers and scientists, with no promise of ever becoming anything more. Worse, it has been an endless source of trouble for Man, the cause of several invasions that had exacted a huge cost on national resources everywhere. With the Great Depression of 1929, he World Economy on its knees in the 1930s, the changing of the physical conditions of Outer Space making it more difficult, if not downright impossible, to travel between planets, it is therefore not surprising that Mankind turned away from space. But something more was necessary to cause Humanity to collectively supress the memories of what had been one of its most glorious ages. This event is what we call the "Forgotten Armageddon." The clues to the existence of a "Forgotten Armageddon" in the early 1940s can be found in C. S. Lewis' transcriptions of the memoirs of noted linguist, Dr. Ransom, published in three volumes, Out of the Silent Planet (1938), Perelandra (1943), and That Hideous Strength (1945), the latter volume having been written in 1942 or 1943. In the first volume, Dr. Ransom was kidnapped by scientists and transported to Mars. Already, we can note the wonderful properties of Aether Space were vanishing, and the artificially-generated gravity that existed previously on Mars was already being discontinued by the Cosmic Powers. On Mars, Dr. Ransom met an Eldil, the representative of these Powers. The Eldil introduced himself in terms that Ransom's mind could comprehend. Being a Roman Catholic, Ransom naturally cast his experience in familiar religious terms, but it was clear that his fellow Earthmen did not see anything but a highly advanced alien lifeform. In any event, the Eldil virtually confirmed most of the theories outlined in this article, including the fact that Earth was considered "twisted" by the Cosmic Powers. Finally, That Hideous Strength told the story of a contemporary Armageddon that happened in England in 1942 or 1943. -- (5) it was clearly won by the Cosmic Powers who did NOT want man to venture further into Space, at least not until he was less ethically-challenged. The occult aspects of the Nazis were developed at length by Louis Pauwels & Jacques Bergier in Le Matin des Magiciens (Morning of the Magicians) (1960). Bergier later wrote a lengthy article on C. S. Lewis, establishing a connection between That Hideous Strength and Naziism. In any event, the Forgotten Armageddon is the ultimate capstone that explains the closure of Earth's first Space Age.